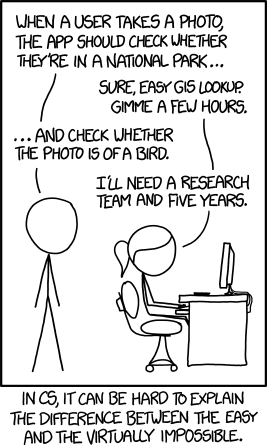 Today’s xkcd comic is relevant to this blog. Noise in images perturbs measurements and makes the lives of image analysis people interesting. There are many sources of noise, depending on the imaging modality: photon noise, thermal noise, electronic noise, quantization noise, etc. I have just found out about another source of noise: etheric entities. Apparently these etheric entities appear especially in “certain photos of human/reptilian hybrids such as Bush or Obama,” and are completely indistinguishable from other types of noise. I’m not looking forward to test my algorithms against this form of noise.